Chris Gray, VP and founding partner of Skyline Attractions. Skyline Attractions was founded in 2014 by a team of four, all of whom were amusement industry veterans. Three of the founders – Jeff Pike, Evan Souliere, and Chris – had all been working together at Great Coasters International, Inc, the company known for its smooth, twisting wooden coasters. 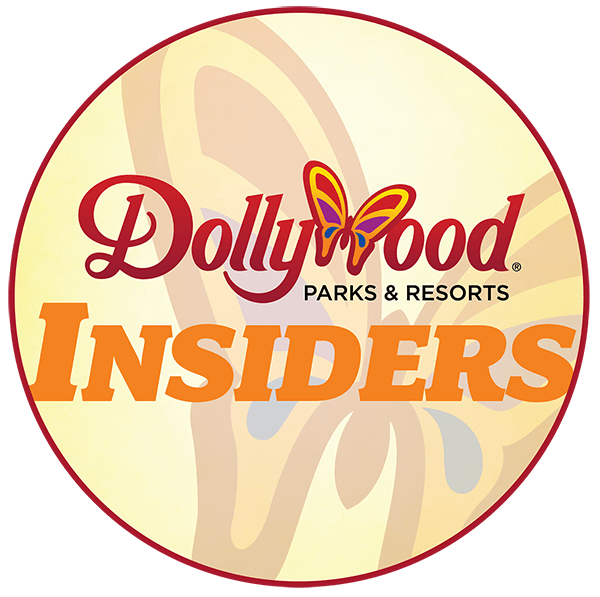 “Jeff (now Partner and President at Skyline Attractions) and I had worked together at Great Coasters International forever,” Gray told us in the interview. Gold Striker, one of our favorite coasters designed by Skyline Attractions founder Jeff Pike during his time at Great Coasters International. That was back in 2002, when Chris took charge of train assembly at GCII. Jeff was the VP of design, and is the mind behind some of the company’s best known coasters, rides like Kentucky Rumbler, Wodan and Gold Striker. Evan Souliere joined them at GCI through the intern program that Chris and Jeff started, later becoming one of their lead engineers. 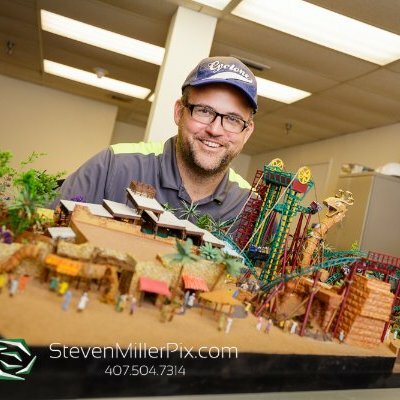 Coaster101 actually interviewed Evan back in 2014 about work he was doing, including on a major project in China. Which leads us to one of the reasons the three of them decided to form their own company. “I think China was really the thing that sort of put us over the edge,” Gray said. With that, the three of them, along with their fourth co-founder, Bill Wydra, began to think about what to do next. That all came from what we can do, what we can design, and how we can change the industry. Show them something they’ve never seen before. Skyline Attractions officially formed in July 2014. In meetings as they were forming the company, the team worked to figure out what it was they wanted to do first. “We had the crazy ideas, and it was just a matter of which one we really wanted to do,” Gray explained. One of those first “crazy ideas” they had is what would become Skyline Attraction’s unique “Games-U-Ride“. 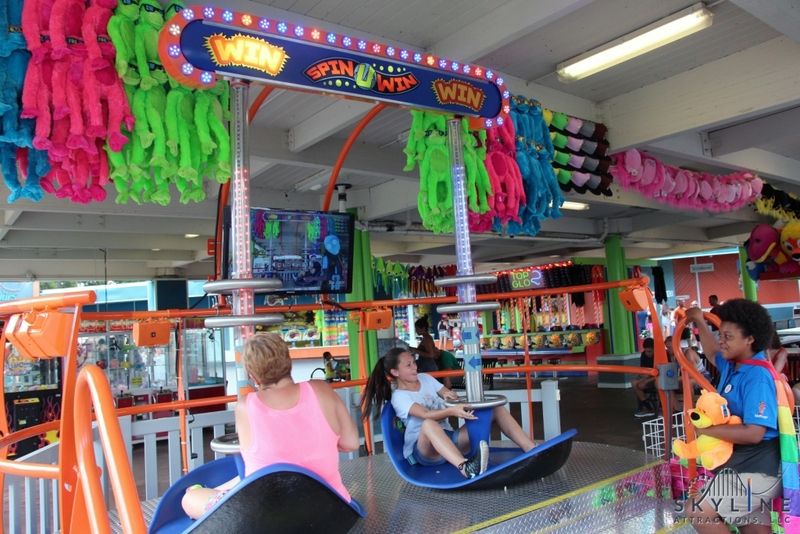 The Games-U-Ride, “Strike-U-Up” and “Spin-U-Win“, are essentially hybrids of classic midway games and kiddie rides. In Strike-U-Up, for example, one guest plays more or less a typical strength test game, hitting a button with a giant hammer. Instead of ringing a bell, though, the hammering actually shoots (well, raises) a seat that their friend is strapped to up pillar. Two pairs of players race to see who can reach the highest. As the name implies, it literally is a game that guests can ride. And it was a first of it’s kind. So where did the idea for the “Games-U-Ride” come from? “Within the first couple weeks of incorporating, and we still hadn’t left Great Coasters, we were taking weekend trips to Florida,” Gray told us. Skyline Attractions ended up building both Strike-U-Up and Spin-U-Win, with the latter going on a revenue share (where the park shares the revenue of the ride with the company instead of buying it outright) to Six Flags Over Georgia, and the former bouncing around the various parks. Most recently Strike-U-Up was at Darien Lake in New York State this past summer, and it will be in the same region next summer. Along with the Games-U-Ride, Skyline also developed a kids ride, as per their initial plan. The Crazy Couch was revealed in late 2015. It’s a small footprint ride, offered in both mobile and fixed versions, and Skyline built and sold several of the crazy couches. The plan had been to start off building smaller rides to fund their eventual big project, but they learned a lesson from these smaller projects. It took effort to sell them. 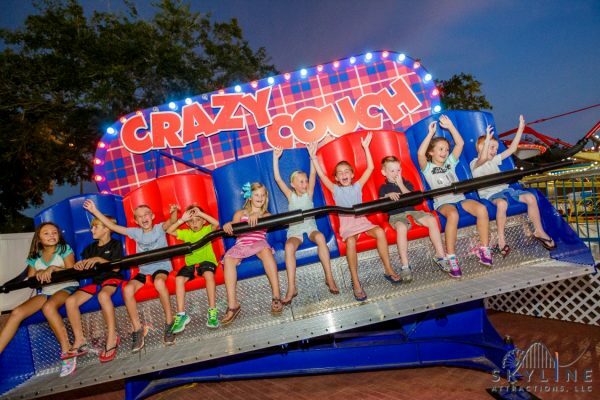 “We were just so excited about introducing something completely new and cool (with Games-U-Ride). It might have blinded us in the realm of is this functionally going to work for a park or carnival at the price that it sits,” Gray told us. With that, the focus shifted from kids rides and games to trying to take the Skywarp concept to a level of detail that it could be marketed and sold. The idea that eventually became the Skywarp started back before Skyline Attractions had actually formed. 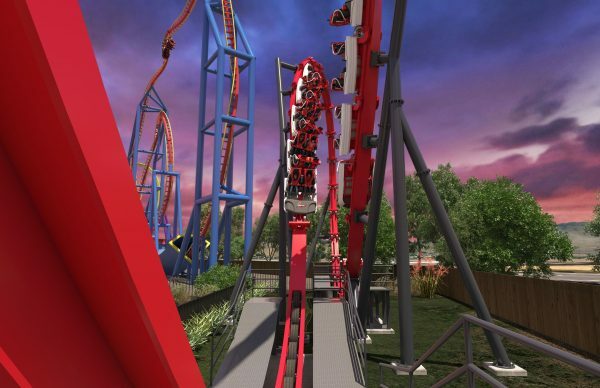 The Skyline team had heard from lots of people that if someone could find a way to build an affordable coaster in a tight footprint, the market could be huge. At Great Coasters they’d heard from customers about a desire for small wooden coasters under 2 million dollars, but it was never really feasible. Skywarp was born out of that goal. The team had been traveling to Florida on weekends to work on figuring out how to form a company, and that’s when Gray had the first idea for the ride. 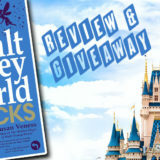 “Basically, it takes some of the coolest parts of all roller coasters and does them over and over. One morning really early, Jeff and I were sitting in the MCO airport, and I was like ‘what if we just did two Immelmans back to back, it looks like a figure 8. '” Gray explained. Pike came back with the idea of making it one big train, giving the effect of two trains passing each other. The original idea was to make it a wing coaster, but they realized that the size of the space and track required for that would blow past the 2 million dollar price point. Instead, they came up with the back-to-back seat design. The concept was then shelved for months, but when they formed the company it continued to come up regularly. The realization that it made sense to go straight to the big project idea brought Skywarp back to the forefront in 2016. That summer, Skyline had an intern with experience using 3D animation tools. He was able to create the first renderings for the ride, and they put the images into an ad in Amusement Today. 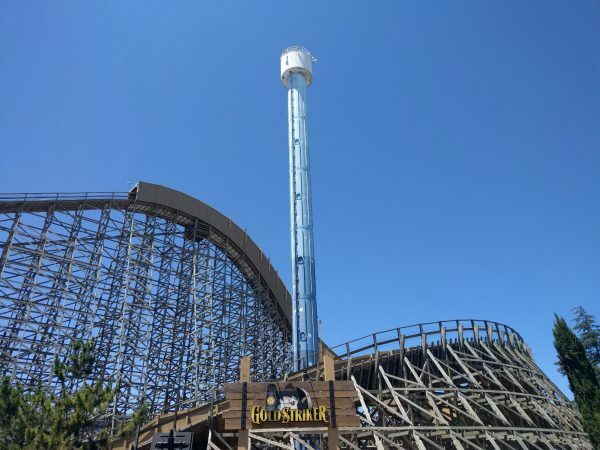 The ad garnered enough attention that Six Flags contacted the company about setting up a meeting at the IAAPA Expo that fall when Skyline revealed the concept. “Everything that operators of all sizes desire: big impact, big thrills, big visibility and big capacity with a small footprint and a small price. After the IAAPA meeting, Six Flags wanted to learn more. The plan was for them to come back to Skyline in March to see if the design had progressed enough that they’d be comfortable buying one. Skyline began working on testing parts of the concept. “So between the show and the first of March, we built a series of different items out in our shop to test the seat and make sure it was comfortable. To test how it sits face to face, and how the restraint would fit. We basically bought a gimbal and put a seat in it with a restraint. We were basically rolling around people on the shop floor in a Skywarp seat,” Gray told us. They had also decided at that point to work with Rocky Mountain Construction (the company best known for hybrid wood-steel conversions) to build the track. Skyline had decided they liked the idea of the monorail track, which RMC had been working on. 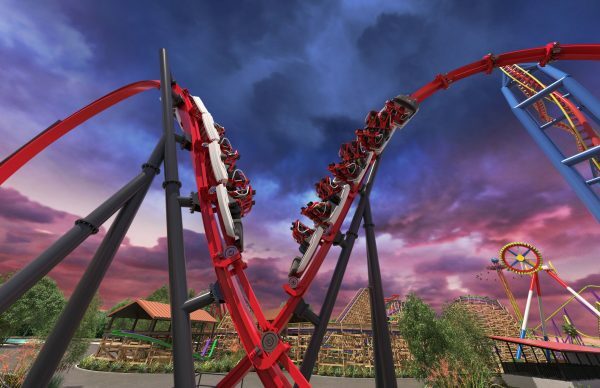 Six Flags had worked with Rocky Mountain on lots of projects, and later that year they would announce a single rail coaster for Six Flags Fiesta Texas from RMC. The Skyline team knew Six Flags would feel good having a proven track maker, that Six Flags knew well, working on the project. 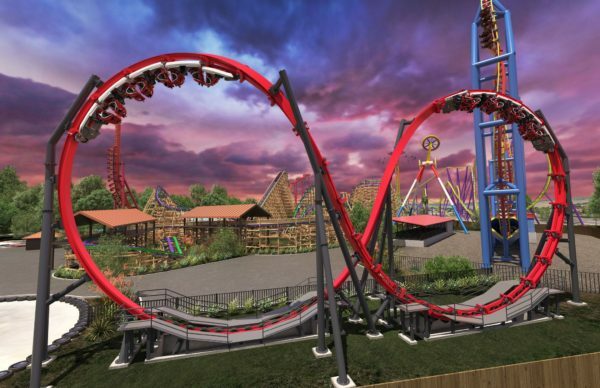 A month later, Six Flags Discovery Kingdom would reveal that they were the lucky park in the chain to be getting the worlds first Skywarp, the Harley Quinn Crazy Coaster. The idea is to go through the top of at that Immelman at zero G, and let the train rotate around you. Part of the trick to making a small, but thrilling, coaster, was to pack as many elements as possible in. 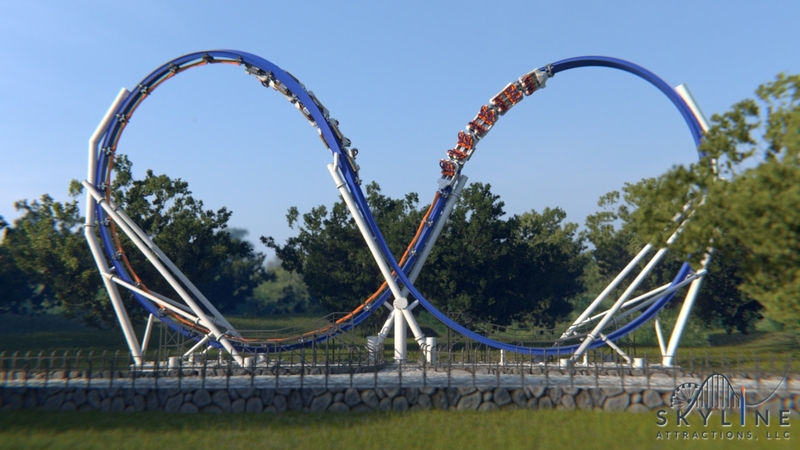 The two heartline zero-G Immelman loops are the obvious features, while the double ended train allows for a fly-by element. 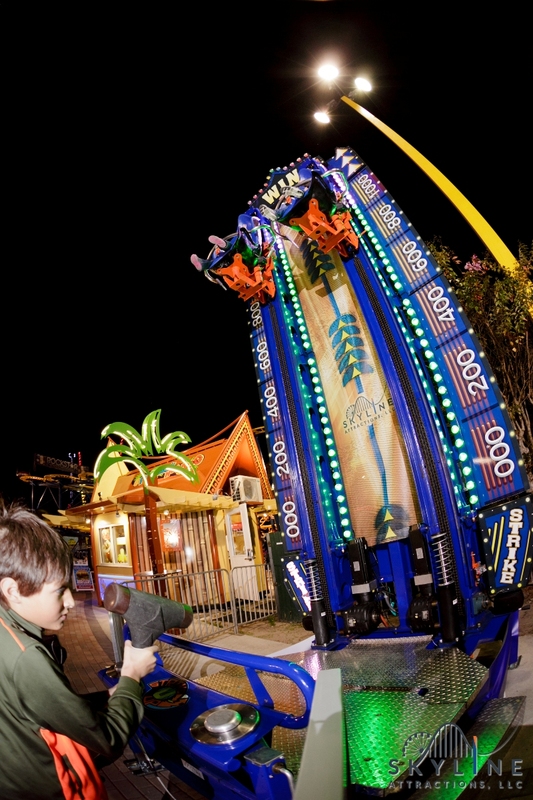 The back to back seats allow riders to experience the ride both forwards and backwards, and the drive system allows it to be repeated multiple times. Originally the ride was going to be driven by Linear Induction Motors, but the cost for the system would have been a quarter of the entire ride price. LIMs are still offered as an option if a park wanted them, but Skyline worked on how to drive it with tires as a more affordable alternative. The double ended train is balanced, so the key is to drive it enough to get it over the top of the first loop. “We have about five feet of complete coast without being driven by anything, ” Gray explained. The actual cycle is still being developed, with Skyline working on figuring out what exactly the Skywarp can do. It will be up to the parks, though, to decide what they want and work with Skyline to get the cycles and speeds they desire. With the sale finalized, work is now coming along on the first Skywarp. 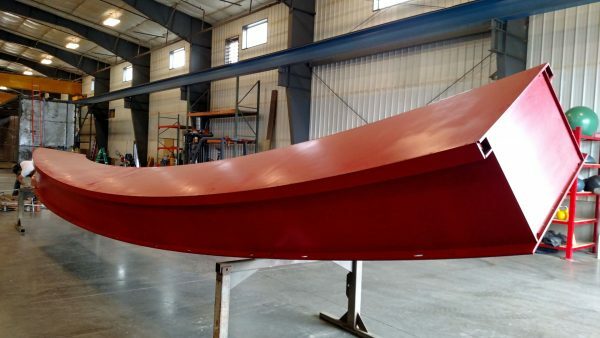 The parts for the first trains of the Harley Quinn Crazy Coaster have all been ordered, and Skyline plans to have them in house by the end of the year. They’re currently working with the team at RMC on how they’ll actually fabricate the track pieces. The goal is to have all of the parts for the ride, including track, done in time to actually assemble the ride first at Skyline’s shop in Florida. And what comes after that for Skyline Attractions? We know that when Six Flags finds a successful new ride they tend to build versions across multiple parks. This came up when we talked to Sally Corp about the Justice League rides they built at six different parks over three years. Chris told us that’s certainly what Skyline is hoping for, but that’s not all they have going on. “We’re all super excited, and working non-stop it seems,” he said. While the Games-U-Ride isn’t their main focus anymore, largely due to the economics, Gray said there are three or four other ideas for games they have. If the price tag could come down, or the economics of park games changes, or they just the right customers, it’s possible we could see more of those unique concepts developed. Our many thanks to Chris Gray and Skyline Attractions for spending time to talk to us. We can’t wait to give the first Skywarp a ride next spring, and can’t wait to see what they have coming next! We’d like to give a huge thank you to Chris Gray, Vice President at Skyline Attractions, for talking to us for this story. We’re really excited to see big projects from a new design company, and we can’t wait to see the progress of the Skywarp over the course of this year. We plan to be at Discovery Kingdom when it opens in 2018. We’ll also be attending IAAPA next week, November 14-17, to see what Skyline might be working on, so stay tuned to Coaster101 for any news. We promise to share our thoughts with Chris. 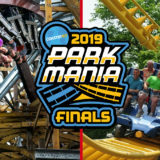 If you want to learn more about Skyline Attractions, check out their website. Finally, share with us any thoughts you have on Skywarp or Skyline, and if you have any more questions about the ride or Skyline, let us know in the comments or on Facebook or Twitter!